Great earthquakes struck the California coast in 1812-1813. They began with the tragic destruction of the church at Mission San Juan Capistrano on December 8, 1812. About forty worshipers were in the church at the time, and the tower of the building fell back onto the nave, with much loss of life. As things go with great earthquakes, a continuous series of substantial shakes followed the first great jolt. The fearsome prospect of buildings collapsing would have forced people into abandoning their customary housing (much of which was probably damaged). The best housing for an earthquake at the time would have been the traditional structures of the Native American people all along the coast. There would be little likelihood of their collapse in an earthquake; and, even if they did collapse, there wasn’t much weight to them. Ocean currents may well have been disturbed by the earthquakes; and there were reports of threatening tidal wave activity, which would have further added to the alarm of the people. Another substantial shock came on December 21. This time, Mission La Purisima Concepcion, northwest of Santa Barbara, was destroyed. The primary quake lasted four minutes, and a second shock lasted five minutes. Mission Santa Ines also suffered damage. A story handed down from generation to generation in Ventura County told how the population of Mission San Buenaventura withdrew from the immediate coast and moved inland to temporary housing. These houses, constructed in the traditional Chumash way, were called casitas in Spanish; and they were clustered near the Ventura River narrows at the southern entrance to the Ojai Valley. The population of the Mission at the time was about one thousand persons. The displaced population, however, was probably not that large; since some of the people already lived regularly at rancherias in the countryside. The number of displaced persons at the narrows, conceivably, exceeded five hundred. 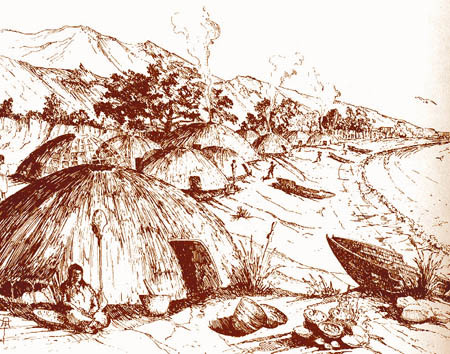 A large casitas was understood to house about ten persons, but the houses at the narrows were temporary, and so may not have been especially large. The number of houses that would have been required for the displaced population at the narrows may have numbered between fifty and one hundred. They would have made a memorable encampment. Earthquakes continued into January 1813, and the displaced community may have been at their temporary location for several months. When Father Senan and the mission population returned to Mission San Buenaventura in March of that year, they discovered that the tower of the church and part of the facade were damaged to such an extent that they would have to be replaced. The name casitas remained after the people left. It was applied to the Casitas Narrows and Casitas Springs. It was used to designate the area extending about a mile to the north of the narrows, which became known simply as The Casitas. It was applied to Casitas Dam and Lake Casitas. The pass to the west was named Casitas Pass, and the valley just over the east Casitas Pass has been known as the Little Casitas Valley. Did you know that the community of Casitas Springs used to be called “Stoney Flats”? No idea as to why. Does anybody know? The town of Ojai is now located in an area of the valley that used to be called “White Oak Flats”; parts of Mira Monte were once “Midway Acres”. Also, David Mason says that Meiners Oaks was formerly “Cheery Acres” and Oak View is actually “Oak View Gardens”. Don’t know who came up with these names, but will try to find out. Very interesting guy’s. Did you know the end Santa Ana road there is a locked gate. There is 100 acres on the other side of that gate that used to be owned by my family. Can you imagine if they would have kept the property? There is a hugh rock on the property with all the families names carved on it. Casitas Springs was called Stoney Flats because underneath all the silt was river rocks. Your explaination makes complete sense. Interested in some more history concerning the community of Casitas Springs? Pick up a copy of the Ojai Quarterly (Winter 2014-2015) magazine that is distributed for free on racks outside of Ojai Valley businesses. Then, go to pages 42 and 43 for “The Story of Ramona” by Patricia Clark Doerner. Doerner’s article is about the filming of a movie about Ramona on Bob Clark’s ranch in Casitas Springs in 1915. Yes, Bob Clark was a relative of Doerner. According to Doerner, the movie was shown at the Isis Theater in Nordhoff (Ojai now) on August 14, 1916. Doerner’s article includes some great old photos of scenes from the movie. One can get an idea of what Casitas Springs might have looked like before it was developed very much. Search this article for information on Santa Gertrudis chapel near Casitas. I just finished reading the first web site you posted about the Santa Gertrudis chapel, Craig Walker. Very interesting! I’m unable to get anything, but gibberish, when i click on the second web site you posted about the Santa Gertrudis chapel, Craig Walker.